Surfaces with primary amino groups covalently bound are dedicated to promote the covalent immobilisation of compounds containing reactive moieties such as amino, carboxyl or thiol groups via well-known homoheterobifunctional linkers, e.g. N-Hydroxysuccinimide (NHS) or Succinimidyl 4-(N-maleidomethyl) cyclohexane-1-carboxylate (SMCC). Several recipes are routinely used for the coupling of biological molecules to amino groups. Specific directions for use require the knowledge of the intended application. As general guideline, the interaction between the amino group on the surface and the functional group of the molecule to be bound is based on covalent binding mediated by homo and heterofunctional crosslinkers. In particular, Ethyldiethylaminopropylcarbodiimide (EDC), with or without the addition of N-hydroxysuccinimide, is a powerful coupling agent of the carboxylic group of the molecule with the amino group of the surface. If the biomolecule to be bound contains ε amino groups of lysine , the simplest method is coupling via Glutaraldehyde, with the formation of a stable amine linkage by reduction with Sodium Cyanoborohydride. Other crosslinkers for this purpose are Dimethylpimelidate and Dissucinimidyl suberate. Biomolecules containing thiolic groups, as Fab-SH or peptides with cystein at terminal end , can exploit the large number of maleimido groups containing crosslinkers as Succinimidyl 4-(N-maleimidomethyl)cycloexane-1-carboxylate (SMCC) for reacting with the amino group. 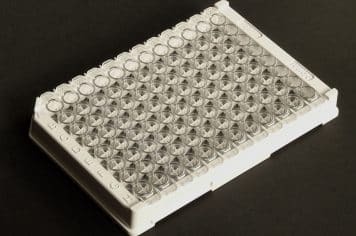 Hereunder are some examples of application that can be used as guidelines to enable users to develop their own bio-specific assays. The surface is modified with primary amino groups. Volume of treatment: 200 µl/well. 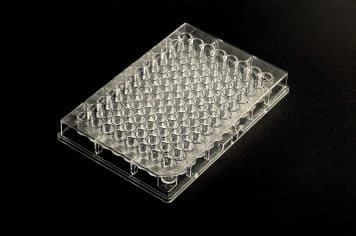 Microplates show a CV% less than 5 when NHS-biotin is bound to the aminated surface in an ELISA format, using Streptavidin-HRP as detector and TMB as substrate.